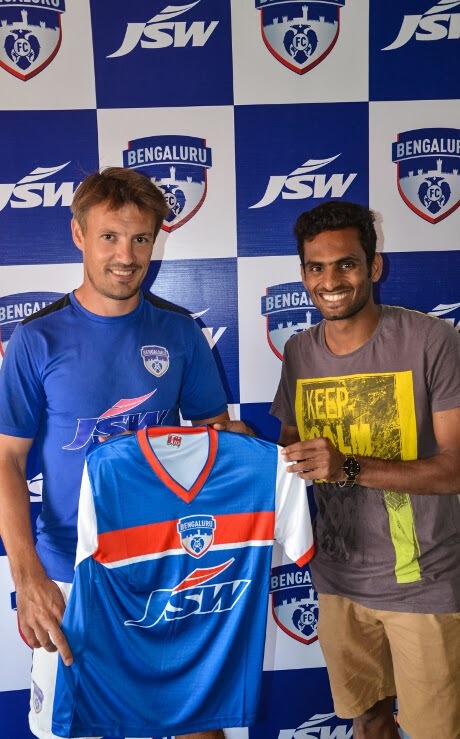 Bengaluru FC on Thursday announced the signing of versatile midfielder CK Vineeth from United Sports Club on a deal that runs through the end of the season. Dubbed as serious title contenders after an impressive debut season that sees them atop the table, Bengaluru’s shoring up of their midfield with the signing is a statement of intent. The youngster trained with the team at the Bangalore Football Stadium on Thursday. Twenty-five-year-old Vineeth’s first tryst with the I-League was in the 2010-11 season where he scored on debut for Viva Kerala. In the League’s 2012-13 edition, he ended up as highest Indian scorer with seven goals. “I am absolutely pleased to sign for Bengaluru FC. Everyone is seeing what the club is doing and the chance to be a part of something this exciting was difficult to turn down. I spoke to a lot of people before taking the decision and all of them had only nice things to say. I also dropped by and had a small run down of the way things at the club are done and I was totally impressed. I also had managed a word with Sunil Chhetri and he spoke highly of the club,” said the Kannur-born lad who started his football with stints at Chennai Customs and Kerala State Electricity Board. Bengaluru FC coach Ashley Westwood was pleased with the club’s latest acquisition. “We are very happy and pleased to have Vineeth on board. He is a player we have been tracking for a while now and someone who had a good last season in the I-League. I’m sure he will be a good addition to the squad and will give us genuine competition for places as he can cover a number of roles. Hopefully, with our methods and standards, we will improve him as an individual and get him back in the national squad,” said Westwood.